Editor, University of Miami Law Review, 1971-1972. 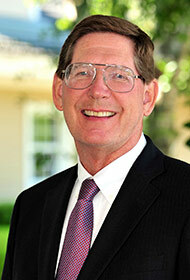 Director, 1989-1995 and President, 1992-1993, St. Lucie County Chamber of Commerce. Fellow: Justice Major B. Harding American Inns of Court. Atlantic Gulf Communities Corp. v. City of Port St. Lucie, 764 So.2d 14 (Fla. 4th DCA 1999) – reversed trial court and held that assessment of stormwater utility fees was invalid for failure to follow statutory requirements. City of Port St. Lucie v. Zlinkoff, 821 So.2d 1130 (Fla. 4th DCA 2002) – upheld trial court order granting full refund to approximate 45,000 member class for invalid stormwater utility fees collected by City of Port St. Lucie. Sherman v. Red Bay Stronghold Foundation, 942 So.2d 1033 (Fla. 4th DCA 2006) – upheld summary judgment granting property tax exemption based upon charitable purpose of conservation. Okeechobee Utility Authority v. Kampgrounds of America, Inc., 882 So. 2d 445 (Fla. 4th DCA 2004) – reversed trial court order and held that utility base facility charge was a user fee and not a special assessment. Indian Harbor Citrus, Inc. v. Poppell, 658 So.2d 605 (Fla. 4th DCA 1995) – vacated jury verdict and judgment for plaintiff and mandated judgment for defendant based upon contract interpretation issues. Jensen Beach Land Co., Inc. v. Citizens for Responsible Growth of the Treasure Coast, Inc., 608 So.2d 509 (Fla. 4th DCA 1982) – Petition for Writ of Certiorari granted quashing trial court order holding DRI development order inconsistent with County comprehensive plan. 99 Broadcasting Co., Inc. v. Crider, 493 So.2d 462 (Fla. 4th DCA 1985) – reversed jury verdict for plaintiff based upon faulty jury instructions. U.S. Life Ins. Co. in the City of New York v. Town and Country Hospital, Inc., 390 So.2d 71 (Fla. 2d DCA 1980) – reversed trial court order granting new trial to plaintiff following jury verdict for defendant which was the lender in a breach of loan commitment case.